As a way to showcase all that the 3DU has been able to accomplish on the campus of WCU, we are hosting a week long event we are calling Whee Make 2019. The event will take place March 25-28th. We will have a travelling booth setup all over campus displaying class projects, student creations, and new and innovative things coming from the Technology Commons. Departments represented in our event include the School of Art and Design, The College of Business, The School of Music, The Biology Department, Interior Design, and many more! Participants in Whee Make will get to see and feel these projects up close, see 3D printing in action, and also have the chance to win 3D printed items and prizes. 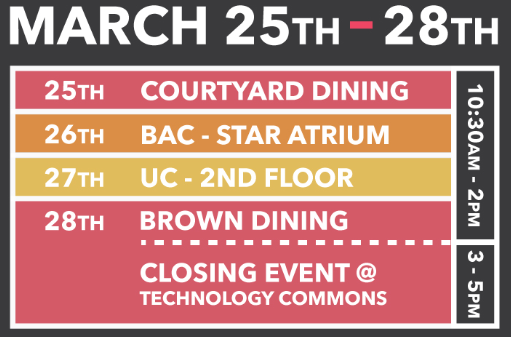 The week will culminate with food and a celebration in the Technology Commons. 3D Printing at WCU student Video!